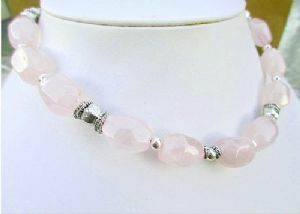 Large chunky soft pink quartz handbeaded necklace with sterling spacers and tibetan floaters for movement . Finished with silver links of chain & adjustable S/Link Clasp. Shown with our "Winged Bling Cross Pendant"